The MCP2140 is a cost-effective, low pin count (18-pin), easy-to-use device for implementing IrDA standard wireless connectivity. 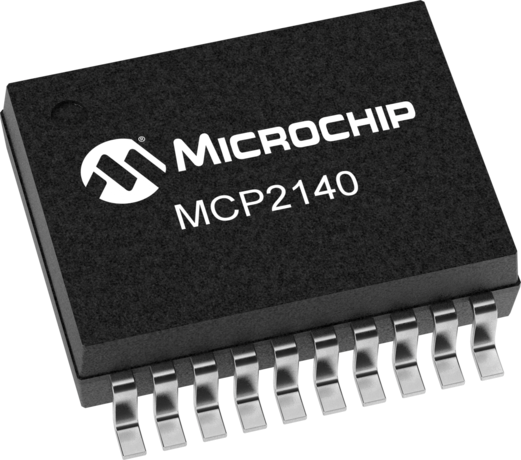 The MCP2140 provides support for the IrDA standard protocol "stack", bit encoding/decoding and low cost, discrete IR receiver circuitry. The serial and IR interface baud rates are fixed at 9600 baud. The serial interface and IR interface baud rates are dependent on the device frequency, but IrDA standard operation requires a device frequency of 7.3728 MHz. The MCP2140 will specify to the Primary Device the IR baud rate during the Discover phase.